Kurt Angle announced that Baron Corbin would be his WrestleMania opponent, which was not greeted kindly by the crowd. Angle went on to defeat Chad Gable in a nice match, and Corbin lost clean to Apollo Crews. The announcers acknowledged the fans not being happy with the decision, but it seemed to be used more as heat on Corbin, not as a sign that they might change it. There were “we want Cena” chants every time Corbin showed up after the announcement. Ronda Rousey destroyed Dana Brooke to retain her championship. She also attacked an official and security guard after the match. When another security guard tried to stop her, Travis Browne decked him with a forearm. Becky Lynch and Charlotte Flair were not on the show. Drew McIntyre beat Seth Rollins clean after Rollins got distracted by Brock Lesnar’s music. Roman Reigns and Dean Ambrose were also not on the show. Brock Lesnar and Paul Heyman came out to a chorus of boos. 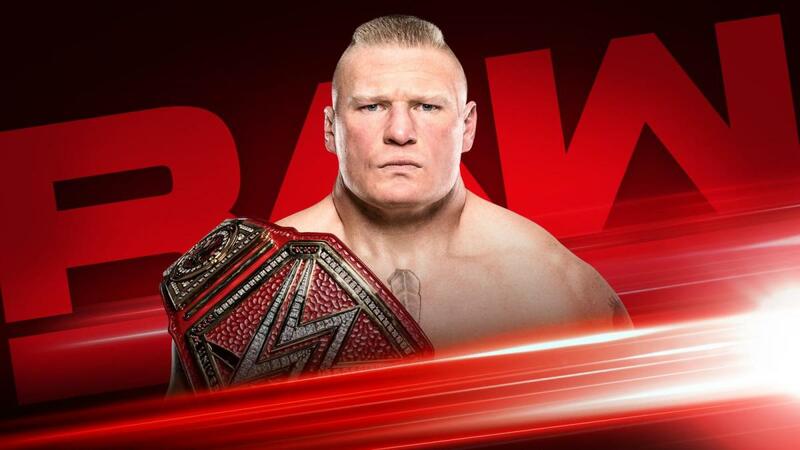 Renee Young said, “it’s about time he showed up to Monday Night Raw.” The crowd booed as Heyman tried to speak, then Lesnar gleefully held up the Universal title belt. The crowd chanted “burn it down.” Despite booing him, the crowd still sang along when Heyman introduced Lesnar. Heyman said Seth Rollins necessitated this appearance by Lesnar and called him a revisionist. He repeated Rollins’ claim that Lesnar has trouble with guys who have the same style. Heyman noted that Lesnar defeated AJ Styles, Daniel Bryan and Finn Bálor. Heyman thought it was funny Rollins would call out Lesnar the same night he has a match with Drew McIntyre. Heyman called McIntyre a career killer, though not the career killer Lesnar was. Heyman wondered what the heck Rollins was thinking by picking a fight with McIntyre after he took out Roman Reigns and Dean Ambrose. McIntyre interrupted. He was glad to finally get the respect he deserved, then told the crowd to shut up. McIntyre said he brutalized Reigns and Ambrose last week and advised Heyman to find Lesnar a new WrestleMania opponent because Rollins wouldn’t be able to compete. Rollins suddenly ran out and hit McIntyre in the back with a chair. He hit him again, then hit him 13 times in a row (I counted) as the crowd cheered. Lesnar looked on somewhat surprised and maybe impressed. Rollins hit the ring but Lesnar bailed, still smiling. Rollins dared him to get in the ring and Lesnar got serious, but Heyman backed him off. Finn Bálor came out and wished the crowd a happy belated Saint Patrick’s Day. He said the luck of the Irish wasn’t on his side last week but didn’t plan on being without the Intercontinental title for long. Before he could say more, he was interrupted by Lio Rush and Bobby Lashley. Rush said the little leprechaun was upset because Lashley had his pot of gold around his waist. The crowd didn’t react. Rush had Lashley pose with the belt. Bálor wanted him he was planning on taking the title soon, then introduced his partner. They went to break 37 seconds into the match. After the break, the heels worked over Bálor. He eventually made the hot tag to Strowman, who came in and literally tossed Rush around the ring. Lashley saved him with a spear, Bálor gave Lashley a double foot stomp, then Rush kicked Bálor out of the ring. Strowman was still down because of the spear, so Rush dramatically went up and hit a frog splash, but Strowman did the strong kick out at two (launching Rush in the air). Rush tried to run away, but he was cornered by Bálor. Lashley ran over Bálor, then Strowman ran over Lashley. Strowman clotheslined Rush, then gave him a huge chokeslam. Lashley walked away, looking back as Strowman destroyed Rush. Strowman finished off Rush with a powerslam for the pinfall win. This was a showcase for Strowman. Bálor sort of came across like a bit player. The announcers said Ronda Rousey was fined by WWE for attacking an official last week. Rousey was shown arriving at the building with Travis Browne (who was named by Michael Cole). A referee approached her and admonished her for being late, then informed her that WWE has hired extra security. She blew him off and kept walking. Bliss talked about their social media followers, then cut to the announcers who ran down the Mania card. Styles-Orton and Batista-Triple H got noticeable pops from the crowd. They cut back to Bliss who talked about being the host of WrestleMania. Bliss mentioned that Lilly Singh was getting her own late night talk show and tried to take credit for her success. This got no reaction. Bliss then introduced Elias, who announced he would be the headline performer at WrestleMania in the world’s greatest city, New York. Bliss called this a safe space and said he wouldn’t be interrupted. Elias said he’s used to being interrupted and thrives on it now. He used an analogy for the Chicago crowd, saying if it was like kicking a field goal, he’d nail it every time. Elias issued a warning to whoever dared to interrupt him. No Way Jose’s music hit and the conga line danced out, led by Otis and Tucker. Elias got in Otis’ face, then a masked member of the conga line attacked Elias. It was No Way Jose. Corey Graves wondered why he would have to disguise himself in his own conga line. Jose went to the ring and revealed a Chicago Cubs shirt, which got a pop. This segment was no good. Jose was in control but missed a high cross, then Elias clobbered him in the corner. They went back and forth for a bit, then Elias nailed a diving elbow drop and Drift Away for the pinfall win. No Way Jose’s conga line chanted for him at ringside throughout the match, which was very annoying. Kurt Angle came out to a loud reaction. Angle said his farewell tour will continue with another match here in Chicago. The crowd chanted “Thank you, Kurt.” He thanked them. He also thanked the McMahon family for allowing him to pick his opponent. Angle said there were a lot of men he wanted to wrestle, but only one man he wanted to beat, the man who made his life a living hell when he was the general manager--Baron Corbin. The crowd groaned. Angle said nothing would make him happier than making Corbin tap out at Mania. This was deflating, to say the least. Gable wore a USA-themed singlet. Gable shook Angle’s hand and told him: “Tonight, the pleasure is all mine. You’re a hero of mine, I want you to know that. Thank you for the opportunity.” A few people chanted “this is awesome” as they got started. They went back-and-forth for a bit until Angle caught Gable with a belly-to-belly, sending him out of the ring. There were light dueling chants for John Cena, then chants for CM Punk which were quickly drowned out by others in the crowd. Gable sent Angle out of the ring, then attacked the leg and proceeded to work it over. The crowd chanted “let’s go Kurt” as he fought back and clotheslined Gable out of the ring. Back from break, Angle cut off Gable with a clothesline, then used a back body drop. Angle went for the ankle lock but Gable rolled through into a cradle for two. Angle caught him with a German and went for a second but Gable countered into an ankle lock of his own. The crowd booed Gable for this. Angle rolled out of it and went for an Angle Slam, but Gable reversed into a DDT for a nearfall. Gable tried a moonsault but Angle moved and applied the ankle lock. Gable fought for the ropes but Angle grapevined the leg and Gable tapped out. This was fun. Angle once again seemed emotion post-match. He helped Gable to his feet and they hugged. Baron Corbin interrupted. The crowd booed. Corbin said it felt good humiliating Angle every week but it’ll feel even better humiliating him in his last match. I think the crowd chanted “we want Cena” but I could be wrong. They cut back to the announcers who ran down some stuff and the crowd could be heard in the background chanting “thank you, Kurt” again. After a break, Corbin was backstage talking at the Revival, who were barely paying attention to him. Apollo Crews showed up and said he wanted a chance to shut up Corbin tonight before Angle shut him up for good at Mania. Corbin was about to deflect but Crews egged him on until he accepted. Crews said Corbin made things too difficult which is why nobody likes him. Corbin said the Revival liked him, but they laughed at him and left. Charly Caruso interviewed Bayley and Sasha Banks in the ring. She mentioned that they made an appearance in NXT but have yet to appear on Smackdown and wondered if they were ducking the IIconics. Banks was about to explode on her for asking that, but Bayley took over. She said they would be appearing on Smackdown tomorrow and it would be… iconic. Natalya and Beth Phoenix interrupted. Phoenix watched their journey and was proud of them. She wished that she had the opportunity to become tag champs with Natalya when she was still a full-time wrestler. She said getting into it with Tamina and Nia Jax awoke the dragon and said maybe their dream could still come true. Natalya put over Phoenix as a hall of famer and she wasn’t afraid to fight them. Banks claimed Natalya was just riding Phoenix's coattails just to get a match at Mania. Natalya smacked Banks, so Banks tackled her. Phoenix tossed Banks aside, so Bayley got in her face. Phoenix pushed her down. Bayley got to her feet and tore off her shirt and they abruptly went to break. The crowd was quiet to start but they got into this by the end. Mojo Rawley yelled at himself in a mirror backstage. Instead of this being a squash match for Ricochet, Mahal got the heat after the Singhs got involved. Ricochet eventually came back with a dropkick, hurricanrana, running shoulder block, flying clothesline and standing shooting star press for two. As the Singhs checked on Mahal outside the ring, Ricochet took them all out with a Space Flying Tiger Drop. Ricochet then hit Mahal with the 650 for the pinfall win. The crowd liked Ricochet, but Mahal being in control for so long quieted the crowd. They announced Sue Aitchison as the recipient of the Warrior Award. Dasha Fuentes asked Rollins about his attack on McIntyre earlier. Rollins said tonight was for Dean and for Roman. It was also for Lesnar, who he hoped was watching his match. Rollins said he would burn Suplex City straight to the ground. Caruso interviewed Dana Brooke and basically asked her if she knew what she was getting herself into. Brooke knew what everyone was thinking, but it was WrestleMania season where dreams come true. She just needed to be better than Rousey for three seconds and she would be the new Women’s champion. Rousey was booed when she entered and was all business. Rousey went for a kick but Brooke caught it and slapped her. Rousey responded with a step-up knee, knees to the gut, then applied the armbar for the quick submission win. This was perfect. Rousey didn’t break hold after the match. Brooke screamed in pain as the referee just yelled at Rousey to stop. Another ref ran down to add to the yelling. Rousey got up and knocked him down. She went to talk to Travis Browne, who was in the first row, then attacked a security guard who approached her. Browne then knocked down another guard with a forearm. Browne lifted Rousey over the barricade and they left through the crowd. Cole noted that there’s an uproar on social media from fans upset about Corbin being named Angle’s Mania opponent. This was mentioned to get heat on Corbin, who apparently responded on Twitter already to suggest he needs a boat to float down the fans’ tears. As Corbin worked over Crews, the crowd chanted “we want Cena.” Corbin went for End of Days, but Crews countered into a small package for the pinfall win. Angle came out to congratulate Crews on the stage. Batista did the interview from his home office in Tampa. Cole asked Batista why he wanted the match with Triple H, to which he responded, “I just don’t like him.” Cole didn’t like that answer and wondered if it goes back to Evolution. Batista said no, it goes back further than that. Batista said people credit his success to Triple H taking him under his wing. He said Triple H groomed him to be his muscle and he had a history of using people to protect him. DX and Evolution were basically the same thing to him. Cole mentioned Batista quitting. Batista said he left because of Hunter, but look at all his accomplished since leaving. He became a movie start without Hunter, and now he’s in control. Cole said he’s known Hunter for 20 years and he’s always been fair to him and has done a lot for NXT. Batista said Hunter has him fooled. They call him cerebral assassin for a reason. Batista said that hopefully, Vince will fire Hunter, then he would end his career at WrestleMania. He then said “interview over” and demanded everyone get out of his office. Backstage, Caruso asked Strowman about the SNL guys and their comments on Twitter. Strowman said he didn’t care what the two idiots said on Twitter. He said they made him so mad that he was entering the men’s battle royal at Mania so as many people as possible would get these hands. Bliss showed up and said it was her responsibility to make sure the show goes off without a hitch (it is?). She wanted to patch things up between him and the SNL guys. Strowman threatened to break them in half, but she pleaded with him again. He gave her a week to come up with something. McIntyre said Reigns wasn’t the same man at Fastlane and relied on his Shield brothers to do all the heavy lifting, but the Shield was no more thanks to him. He said this was his yard now. He had a message for Reigns, not the superstar Roman Reigns, but the man, Joe. He said Joe was sitting at home now because of him and challenged him to a match at Mania. He told Joe to look at his wife and look at the tears in the eyes of his children. He and the fans knew that Joe would answer yes, but he urged Joe to say no for the sake of his family. What he did to Ambrose and what he will do to Rollins is nothing compared to what he will do to Reigns at Mania. McIntyre said Reigns beat leukemia but he can’t beat him at WrestleMania. A seething Rollins appeared on the screen and said that was the reason he did what he did earlier, then they abruptly cut to a replay of the chair attack. Rollins said the attack earlier was for his brothers, but this was going to be for himself. He ran out to the ramp where he met McIntyre and they traded blows until they were separated by officials. The announcers talked about how stupid Rollins was for taking this match so close to Mania. Rollins went for a moonsault to the outside but McIntyre swatted him into the barricade. After a break, Rollins went for a suicide dive, but McIntyre caught him and drove him into the barricade. McIntyre grabbed a steel chair and was ready to use it but Rollins caught him with a superkick. They beat a ten count, then Rollins suddenly fired up, sitting consecutive dives (at blazing speed), then a slingblade for two. Rollins hit a superkick to the gut when Lesnar’s music hit. Rollins decided to look at the stage, then turned around in time to eat a Claymore kick. McIntyre wins. Lame ending.